Chances are your organization relies on a range of software solutions to run more efficiently. The days of large organizations being locked into a single, all-encompassing software program to run all mission-critical processes are long gone. So, if the social media solution you rely on works seamlessly with the tools other teams use, it makes everyone’s workday run just a little smoother. And because your teams are already familiar with these solutions, your IT and training budgets get a break. So, in no particular order, here are eight apps to help your enterprise-sized organization scale social seamlessly. Slack has quickly become a favorite collaboration tool for organizations of all sizes, helping people get things done. The Slack app for Hootsuite is a great way to collaborate around social. It lets your teams send social media posts directly to a specific Slack channel, user, or group right from the Hootsuite dashboard, making it easy to keep everyone in the loop. You can even capture relevant social information for each message, and add sentiment and a comment along with each post. If your organization already relies on Google Drive, this app is a must-have. It lets users view, sort, and search for Google Drive files right from within Hootsuite. That means everyone who’s working with your social media accounts can share the same secure access to a single location for all approved brand assets, images, and other files. Plus, you can include Google Drive as a destination when you post to social, automatically creating an archive of your all of your social posts in one easy-to-access location. You’ve invested a lot of time building your brand on social media, but is it as protected as it could be? ZeroFOX provides automated protection against social and digital threats, including phishing, account takeover, and brand impersonations. With the ZeroFOX for Hootsuite app, you’ll get automated alerts right in the Hootsuite dashboard when your brand and social accounts are targeted with dangerous or offensive content, including malicious links. Then you can take action by requesting takedowns or by sending the alerts to the proper parties, all from one place. If you rely on Marketo for your marketing automation, this app adds the power of social to your lead management. Now you can create Marketo leads from Twitter and Facebook activity you discover in Hootsuite. You can also see lead details right in a Hootsuite stream, including their name, email address, and company, as well as the lead’s source, score, and status. That makes it easy to drive lead scoring and push leads deeper into your sales funnel by adding details of their social activity—all without leaving Hootsuite. Chances are a growing percentage of the requests your organization gets for tech support or customer service now come through your social profiles. The Zendesk app for Hootsuite lets your team create new Zendesk tickets from Facebook or Twitter posts, from your Hootsuite dashboard. Your team can view ticket details including status, requester, subject, description, comments, groups, assignees, and more. They can also update and edit tickets, as well as add comments or internal notes, all without leaving Hootsuite. Amplify is an intuitive app that makes it easy—and safe—for your workforce to share approved social content with their own friends and followers. As part of a complete employee advocacy solution, Amplify lets you save time by managing social messaging and amplification, all from the Hootsuite dashboard. You can then measure results by tracking top-performing posts and which ones your employees share the most. You can also use Amplify to boost employee engagement by making it easy for your people to stay connected and informed about what’s happening in your organization. The leading customer relationship management platform gets even better when integrated into Hootsuite. The Salesforce app is a great resource to support social selling, making it easy to Identify and capture new sales leads and opportunities that you discover on social into the CRM you already rely on. With this app, you can see details and activity history for your Salesforce leads and contacts, and add key social activities and conversations to their records. You can also add and search details of Salesforce customer cases right within your Hootsuite dashboard. The Brandwatch app lets you monitor and analyze social mentions from more than 70 million sources—including major social channels, blogs, forums, and news and review sites—right from a Hootsuite stream. Brandwatch’s advanced sentiment and impact scoring even lets you monitor the tone of mentions, so you always know what people are saying about your organization or brand. 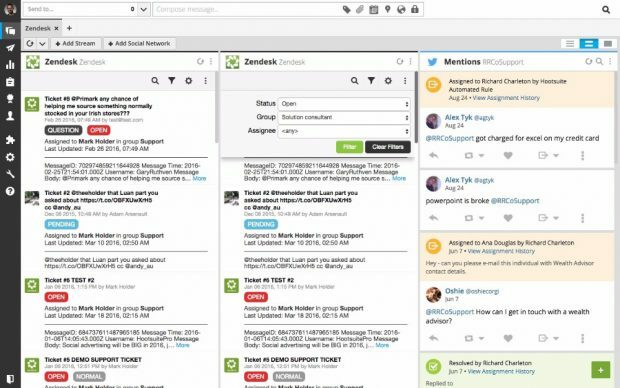 Direct integration into Hootsuite lets you assign and respond to mentions Brandwatch discovers instantly from your Hootsuite dashboard, while using your existing workflows. From smarter collaboration to stronger security, these apps integrate with Hootsuite to save you time and let you do more—right from within your dashboard. That makes it easy to bring the power of social media to the tools that already support your business.